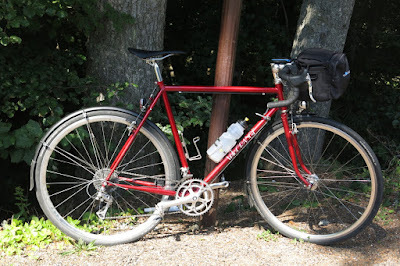 A few months back, I build a new bicycle around the Velo Orange "Pass Hunter" frame. 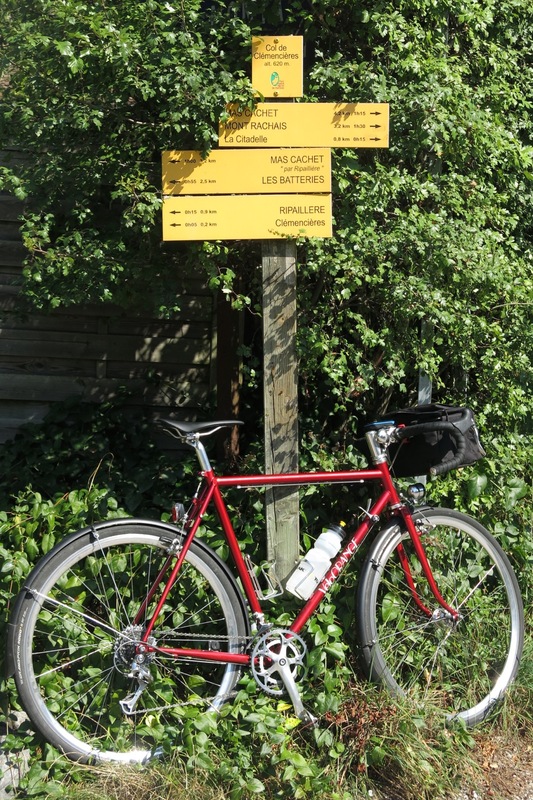 Its intriguing name is inspired by the the sport of chasing passes, and its seat tube decal an hommage to the logo of its 'governing body': centcols.org. 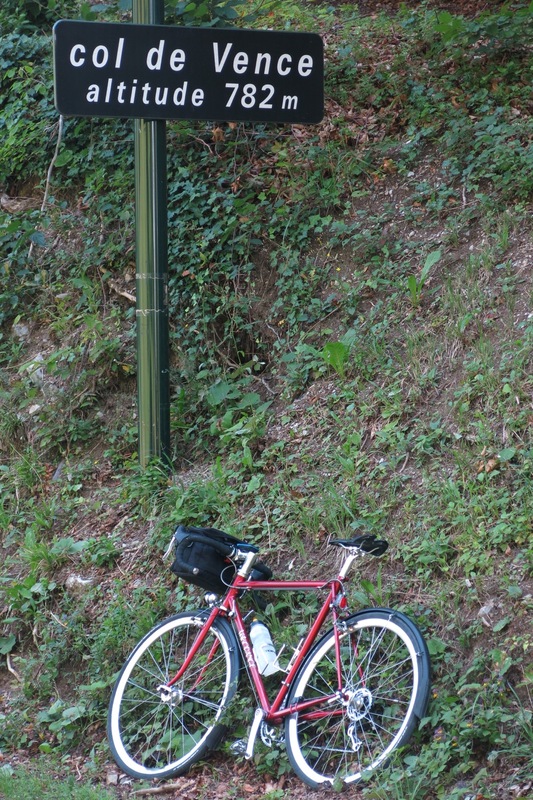 And while I am now grounded to the flatness of Hamburg, this is what I liked to do most on a bicycle, when still living in the mountains. Only recently, I realised how far the mountains actually are from where I live now - the 600 km Brevet had its turning point on top of the first significant hill (from Hamburg and for my VO Pass Hunter): the Brocken in the Harz. 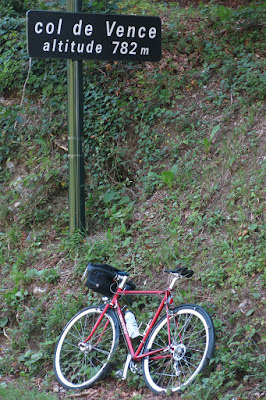 And I sure would put the new bicycle trough its paces a soon as I had an opportunity, which finally came in the form of holidays in Grenoble, France. A day trip around and across the Chartreuse mountains had me re-visit a number of the places I enjoyed, and glance views of many summits I used to hike, climb and ski. Col de Clémencières, 620 m.
The trip started with the Col de Clémenicières, which separates the emblematic "Neron" from the "Bastille" dominating the city and was part of one of my favorite evening excursion "Tour du Neron". Col de Vence, 782 m.
By the very definition of a pass, the route is "locally the highest point" on "the lowest possible route". Col de Palaquit, 1154 m.
Yet instead of following down the lowest possible route, I turned the pass into a saddle and headed further up, doing so two more times on Col de Vence and Col de Palaquit, before really peaking for the first time on Col de Porte under the Chamechaude mountain. Col de Porte, 1326 m.
The first downhill speeds down fast inclines on routes with barely any cars before the next climb, which unassumingly starts in St Hugues with some false flats before gradually steepening and finally turning into a serious but rewarding grind. The views back into the chartreuse Mountains, up la Dent des Crolles towering the col, and towards the Belledone range on the other side are worth every revolution of the pedals on the slopes attaining 16%. Col du Coq, 1435 m.
Zipping trough the twisting switchbacks facing the Belledonne range in an exhilarating descent, quickly brings me down to the village of St Hilaire du Touvet, which is famous for its paragliding opportunities. 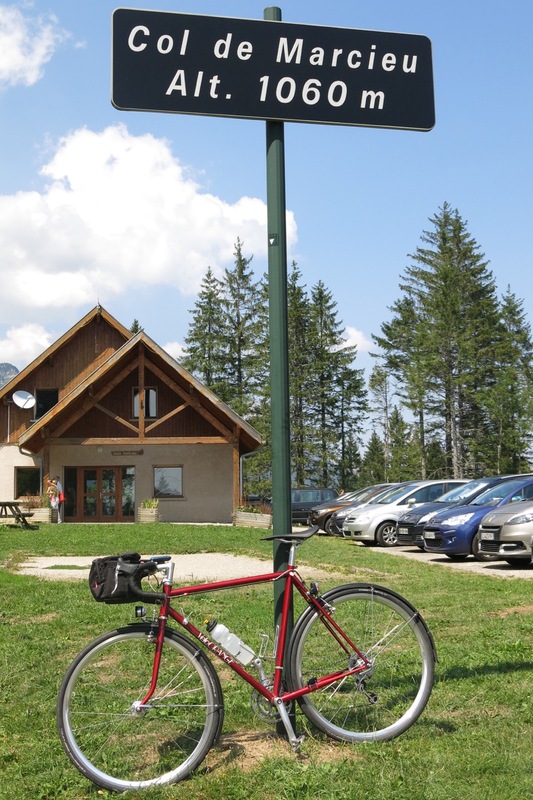 Col de Marcieu, 1060 m.
The road follows the foot of the abrupt east face of the Dent de Crolles, Dome de Bellefont, Aup du Seuil and the Rochers de Bellefont. Passing Col de Marcieu brings back fond memories of endless hours spent climbing these cliffs hiding some of Europes most spectacular natural arches and improbable passages across the steep faces. Col du Granier, 1134 m.
The Col du Granier has to be earned by another winding climb under the North face of the homonymous mountain in the heat of the afternoon and is rewarded by some excellent blueberry cake at the cafe on top. Col du Cucheron, 1140 m.
A fast descent with many straights brings me back into the heart of the Chartreuse mountains, and after crossing the Col du Cucheron the road passes close to the monastery (Monastère des Pères Chartreux), which is famous for its liquor and lends the entire mountain range its name. Col de la Placette, 588 m.
The impressive creeks of the Gorges du Guiers Mort lead down to St Laurent du Pont and finally to the gentle climb up Col de la Placette before one last descent and a comfortable bicycle path along the Isère river brought me back to my starting point. 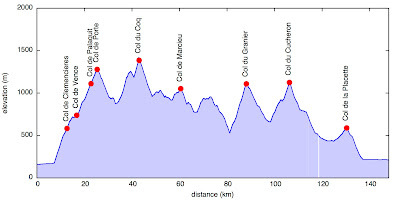 Elevation profile. 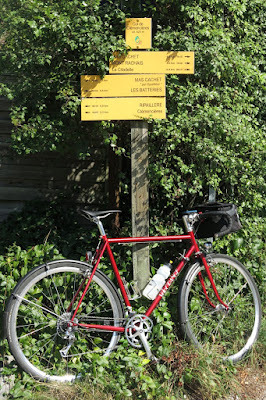 9 mountain passes, 148 km, 3400 m elevation gain. 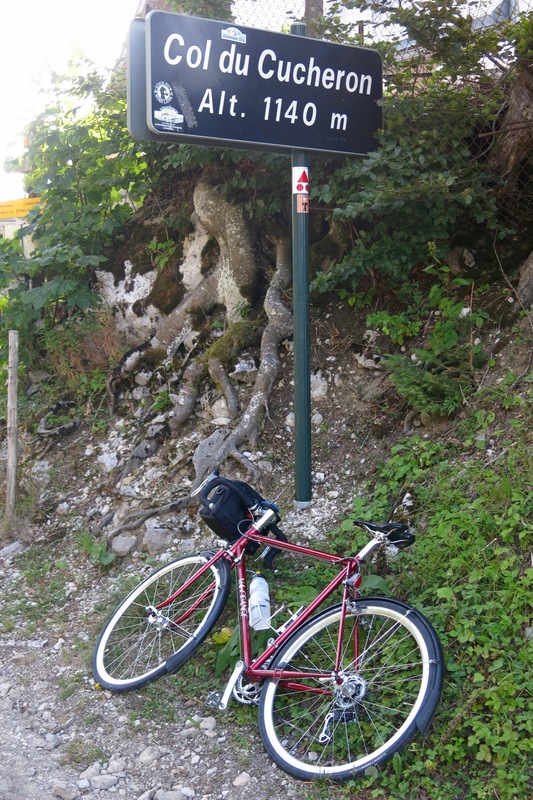 Col de Clémencières, 620 m. IGN geoportail, cols-cyclisme.com. 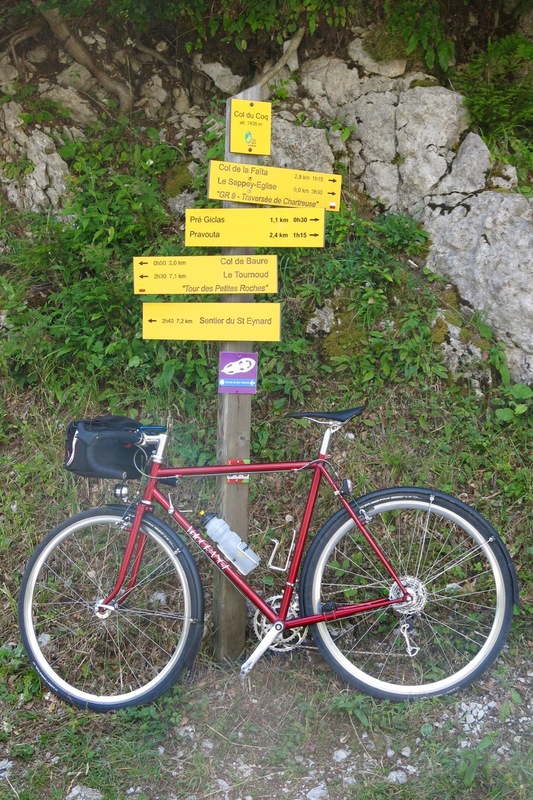 Col de Vence, 782 m. IGN geoportail, cols-cyclisme.com. 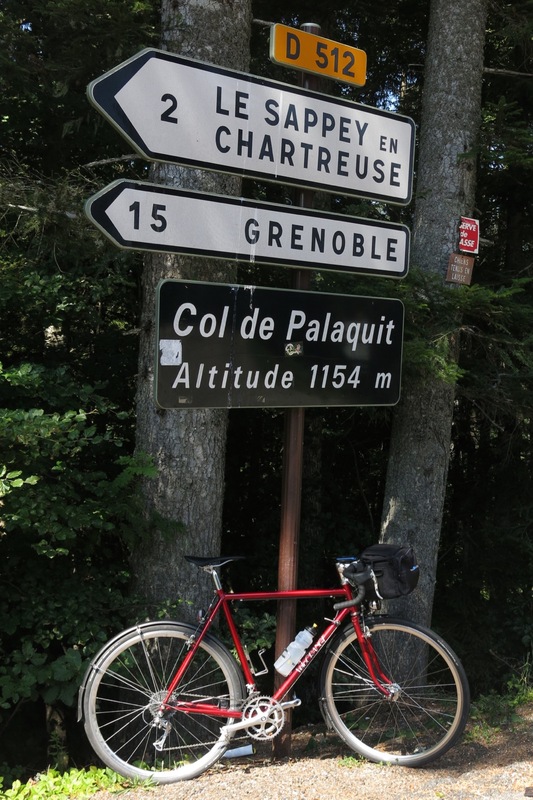 Col de Palaquit, 1154 m. IGN geoportail, cols-cyclisme.com. Col de Porte, 1326 m. IGN geoportail, cols-cyclisme.com. 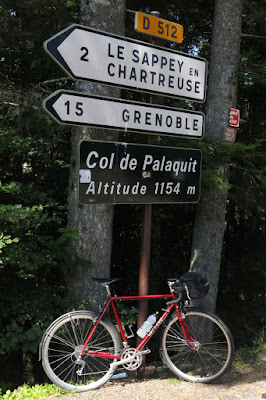 Col du Coq, 1435 m. IGN geoportail, cols-cyclisme.com. 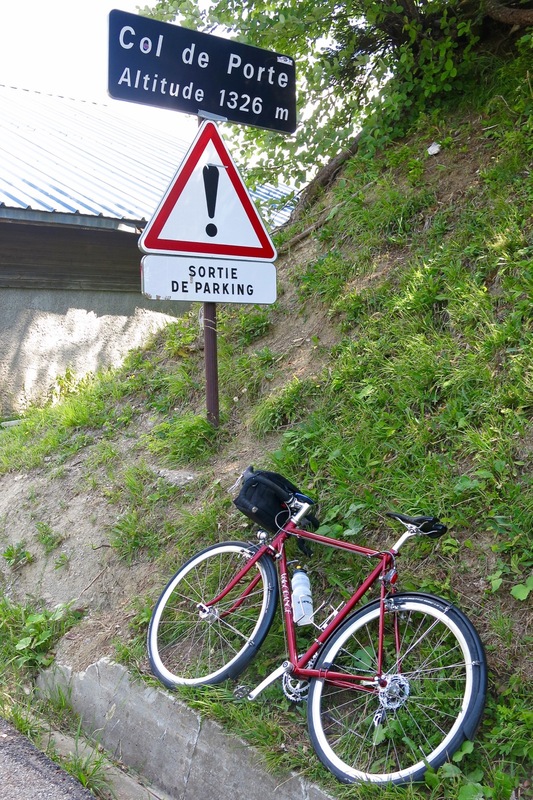 Col de Marcieu, 1060 m. IGN geoportail, cols-cyclisme.com. 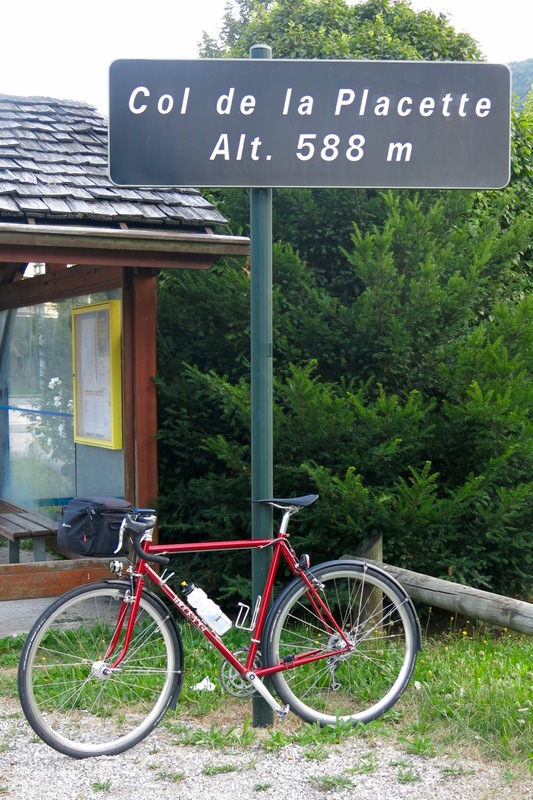 Col du Granier, 1060m. IGN geoportail, cols-cyclisme.com. Col du Cucheron, 1140 m. IGN geoportail, cols-cyclisme.com. 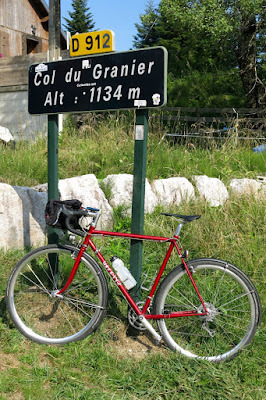 Col de la Placette, 588 m. IGN geoportail, cols-cyclisme.com. inclines, and zipping through twisting switchbacks. And the Velo Orange Pass hunter in all that? 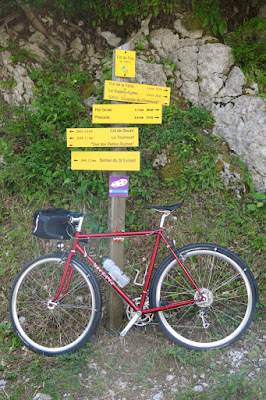 It certainly did not hold me back grinding up winding ascents and steep cols, speeding down fast inclines, and zipping through twisting switchbacks. It now has honestly earned its name. This is impressive experience that you share with us. Its unbelievable performance. Visit my home page to know more about cycling. 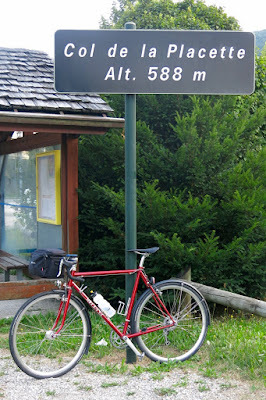 9 mountain passes, and about 148 km with 3400 m of gain is a great achievement.